Description: The extra 6379 west gets a shove from it's sister unit, SD40-2 6378. Regular helper service would end on Washington Hill in the summer of 1982. Description: CR SD40-2 6378, GP38 7910, and SD45 6177 lead a hot TV train past a slower mixed freight as they both pound up the hill at Horseshoe Curve. Description: CR SD40 6313, a U23B, and a GP38 lead mixed freight up Horseshoe Curve as a hot TV train climbs the hill alongside. Description: CR SD40-2 6378, GP38 7910, and SD45 6177 pass a slower mixed freight as they both climb the hill at Horseshoe Curve in March, 1981. 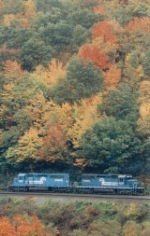 Description: Conrail black and blue on a pleasantly cool day in Gallitzin, PA. 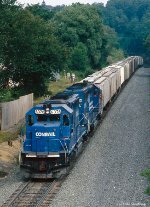 Description: A 158 car UBT coal train makes its way across Rockville Bridge in this telephoto view. Description: A 158 car UBT coal train rolls off Rockville Bridge with three CR units and a visitor from CSX. Description: A pair of helpers on the back end of an Eastbound that has started down the "slide". Title: The Norfolk Southern takeover is reality as a pair of unrenumbered ex-Conrail EMD SD-40-2's are being used in their familiar role as helpers ahead on the "Mountain"